The Lake Chelan AVA hosted a Spring Barrel Tasting Weekend May 18th and 19th. There are 20 wineries surrounding Lake Chelan and 11 of them were offering barrel samples during the two day festival. If you are curious about the winemaking process then a barrel tasting event is something that will help shed some light on what happens behind the curtain. The experience provided an opportunity to learn how barrel aging influences the finished product. And it also gives you a chance to chat with the winemakers in a relatively casual setting. In the two days I spent in Lake Chelan I was able to visit 12 of the wineries. Getting around to this many wineries emphasized the diversity of winemaking styles that exist across this wine destination and region. All of the wineries I visited had some of their best efforts available for tasting. Of the 12 locations I visited, 8 of them were providing barrel tastings. The winemakers were available at nearly all the places and were happy to discuss winemaking techniques and philosophies. Nefarious Cellars had 2012 Grenache and 2012 Defiance Vineyard Syrah. The Grenache was in a neutral barrel, it featured notes of cedar floating on top of medium red berries and light earthy spices. 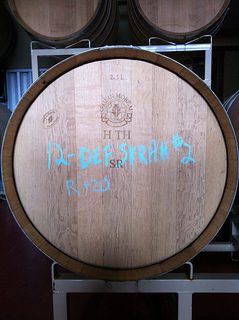 The Defiance vineyard Syrah was in a new French Oak Barrel and it was showing some dark savory character along with a touch of sweetness and white pepper. Chelan Estate had a 2008 Pinot Noir. This one definitely won the award for most time spent in barrel. They are nearing the end of the 2007 stock and will be bottling the 2008 soon. This Pinot Noir was showing some nice medium red fruit, Asian spices and some decent acidity. Tunnel Hill had two barrels of 2012 Malbec. A neutral barrel and a new French oak barrel. This was one of the more interesting tasting experiences since you were able to taste the difference between the two barrels. The neutral barrel featured rich black cherry and cola. The Malbec from the new French oak barrel was loaded with oak that blew off to expose tart currants on the palate and finish. Cairdeas was sharing tastes of their 2010 port style wine made from Cabernet Sauvignon. It was rich and dark with notes of currants, hazelnut and a solid dose of cedar spices. Tildio was sampling their 2011 Garnacha and Malbec. The Garnacha was showing dark sweet fruit, cedar, candle wax and pepper spices. The Malbec was robust with notes of licorice and tart coffee bean. 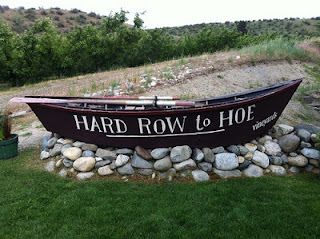 Hard Row to Hoe had their 2012 Sangiovese available for tasting from a neutral oak barrel. This Sangiovese is tasting nice already with some cranberry, strawberry and smoky spices. Once this wine hits the bottle it will age for another year before release. 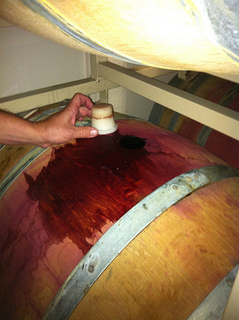 T’sillan Cellars had their estate Syrah in a new French oak barrel. It was showing dark currants and hazelnut with some serious barrel notes. Surprisingly, things were pretty slow here so I was able to have a great visit with Shane, the head winemaker, and his assistant winemaker Kyle. This was a great weekend experience and I would highly recommend it for an easy getaway. If you live on the West side of the Cascade Mountains, Lake Chelan is an easy three hour drive out of the rain and into the sunshine. Along with the sun you will find some serious, and friendly, winemakers plying their craft. Each has their own style. The diversity and friendliness are two ingredients that make a visit to Lake Chelan a true destination. Thanks for highlighting some of the great things about the Lake Chelan Wine Valley. More and more people are discovering Lake Chelan everyday, not only as a vacation spot but for the wine too! The next valley-wide barrel tasting event will be Thanksgiving weekend, mark your calendar!